More Card Collectors Company related goodies today cadets! 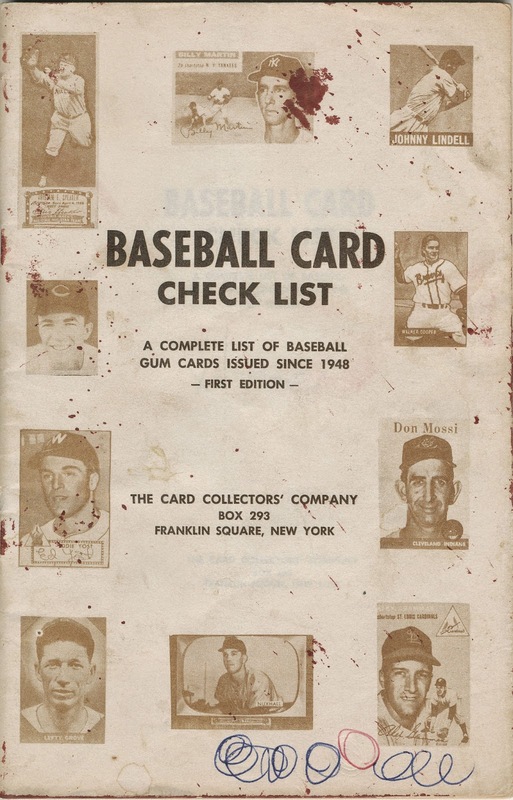 Issued in 1960 for $1.25 plus 10 cents postage, this 64 page pamphlet was bare boned but contained complete checklists for all main Topps sets through 1960, the 1955 Double Header and 1956 Baseball Buttons plus the two existing Bazooka sets. In addition, there were complete checklists for Bowman (including the 1949 PCL issue), the 1959 and '60 Fleer issues, 1949 and '60 Leaf and the Dormand Postcard set (described as the "finest reproductions ever made of baseball players"). 1949 Bowman PCL - "The series is so difficult to find that most collectors will never see one....the bulk of the print run was destroyed." 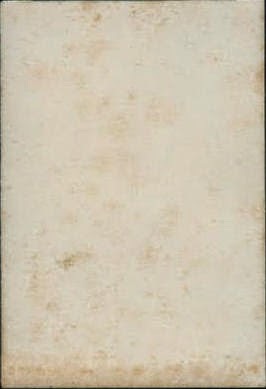 The reproduction of an example, front and back, was likely the first time 99.9% of the hobby had ever seen one of these. 1949 Bowman (Major League Baseball) - "...the scarcest of the Bowman major league sets...all full sets are extremely rare." 1953 Bowman - "In order to lengthen the series to compete with the long Topps series on the market, Bowman issued an additional set of black and white cards." 1955 Bowman - "...the beautiful television design was extremely popular and remains among the most desired of all baseball sets." 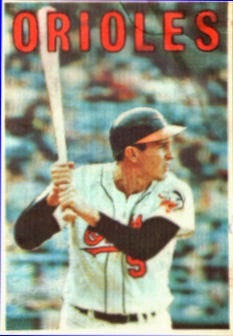 1959 Fleer Ted Williams - No mention of card #68 being scarce. 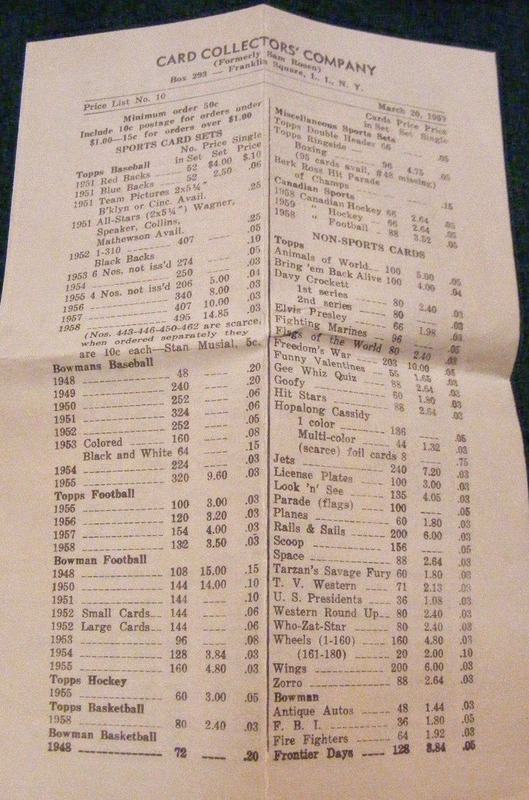 1949 Leaf - No high number short prints are listed, only the 49 low numbers. 1951 Topps - "In addition there were a number of larger cards of exceptional interest...another group was a Current All-Star series. 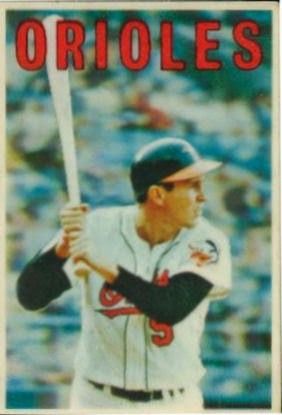 Though the cards were issued only a few years ago, it is virtually impossible to complete the set." No mention is made as to the scarcity of the three super short prints in the Current All Stars, they are listed along with the other 8 cards. All five of the intertwined sets are listed together under this generic heading. The two Red Back variations are incorrectly ascribed to the Blue Back series. 1952 Topps - "Number 311 to 407 were issued in a much smaller quantity and as a result these numbers are exceedingly scarce." 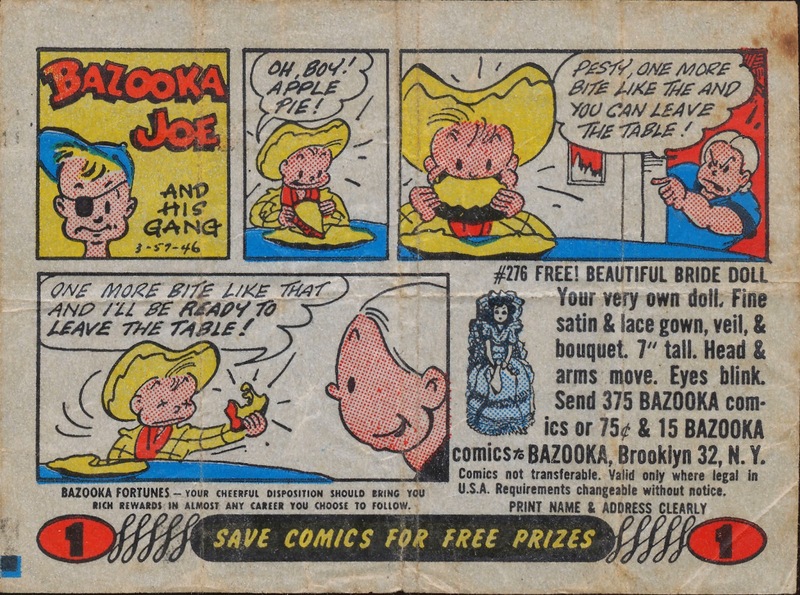 1955 Topps - "The cartoons on the reverse side were drawn by Irwin Hasen, who draws the famous cartoon strip 'Dondi'". 1956 Topps Baseball Buttons - "These unique Buttons are getting scarcer all the time." The CCC Check List was issued and updated through sometime in the 1970's I believe and would have been a key, early hobby resource. 4) Stamped Back* (asterisk as it could be the same as #1 but I don't necessarily think so). I'm not sure on sizing but Starr seems more square than ol' Tucker (who in turn appears handcut). 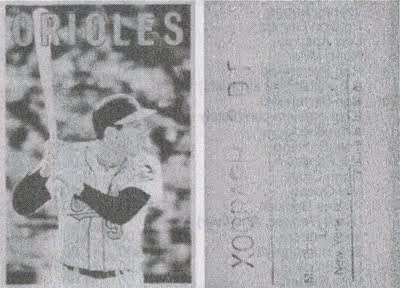 Keith Olbermann's authoritative article on the 3D cards in an SCD article dated March 23, 2007 does not mention the two cards of Starr and Frederickson but does mention the Cane (soccer) prototype. Frederiskon is in an SGC AUTH holder so the registry over there should hold some additional information. I wonder if more are out there waiting to be found? 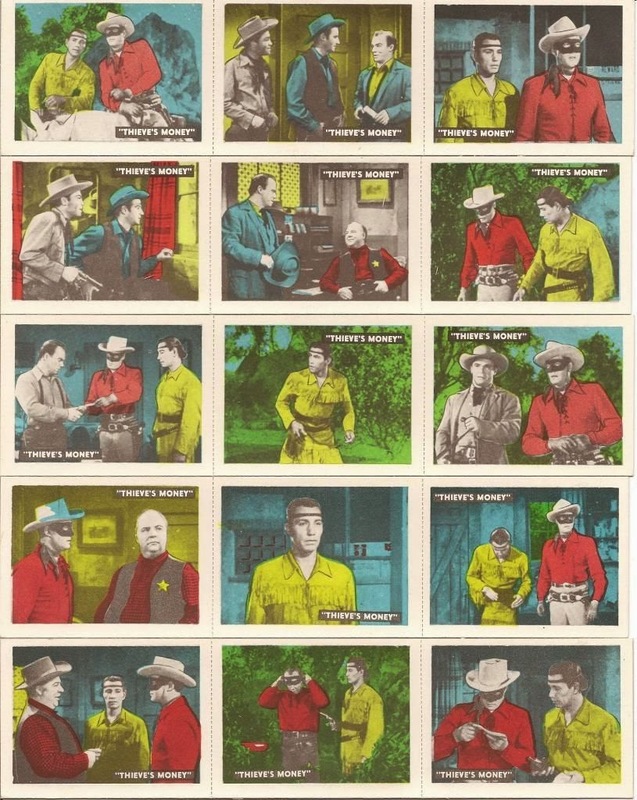 In 1950, just as Topps was rounding into form with their card sets, there appeared on the store shelves a little number called The Lone Ranger. Clayton Moore was riding high as John Reid, the lone survivor of a terrible ambush (and incidentally Grand Uncle Of Britt Reid, a.k.a. The Green Hornet--I'd link it but it's more fun to Google it!) along with his faithful sidekick Tonto (Jay Silverheels) and in 1949 saw his fortunes rise as The Lone Ranger transitioned from radio to TV. 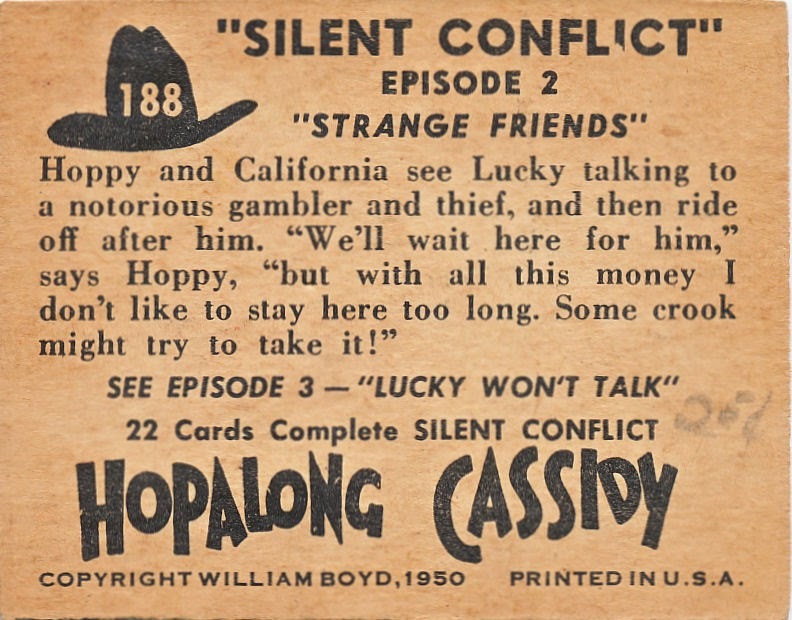 If you think those cards look a lot like Topps' Hopalong Cassidy high numbers you're right. The font used for the set name is identical to that of The Lone Ranger and there are just too many stylistic similarities for this to be a coincidence. I've previously documented some common elements between Topps and Ed-U-Cards baseball deck games and this is just more evidence of a link between the two companies (Ed-U-Cards was based about ten miles from Topps in Queens). Topps either clearly designed the set for their competitor or had created it for their own purposes and decided to sub-let it instead. 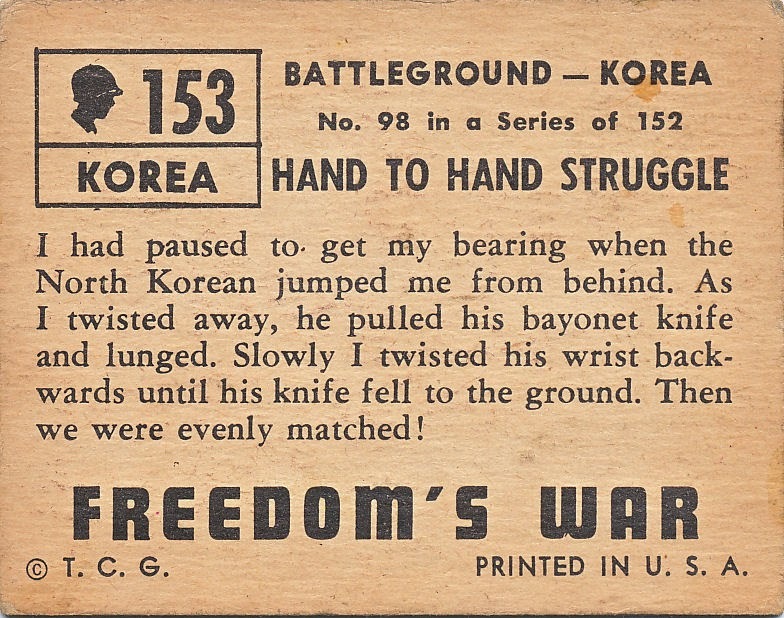 Either way, it's a fascinating little slice of Topps history. 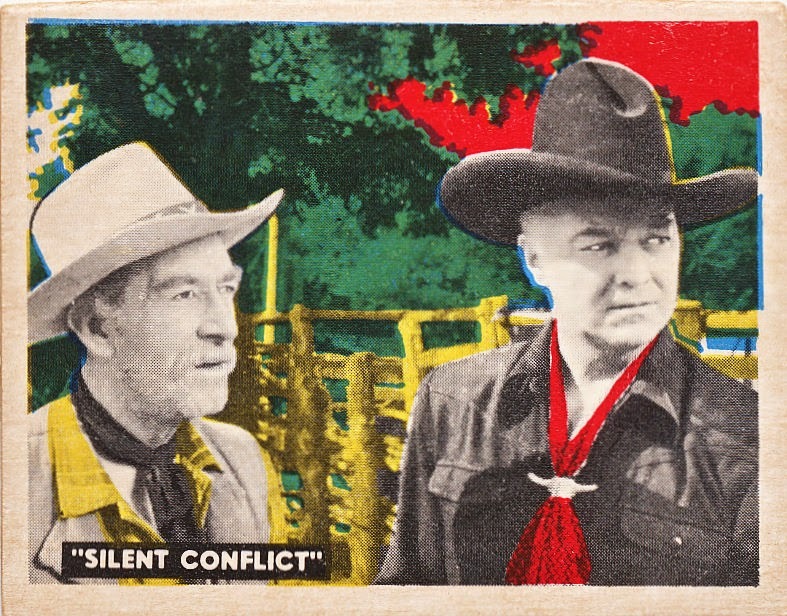 The Lone Ranger cards individually measure 2" x 2 5/8", a little smaller than the 2 1/16" x 2 5/8" measurements of Hoppy and Freedom's War. The perforations are much finer on The Lone Ranger than on any Topps cards that were issued in (two card) panels of the era to boot. 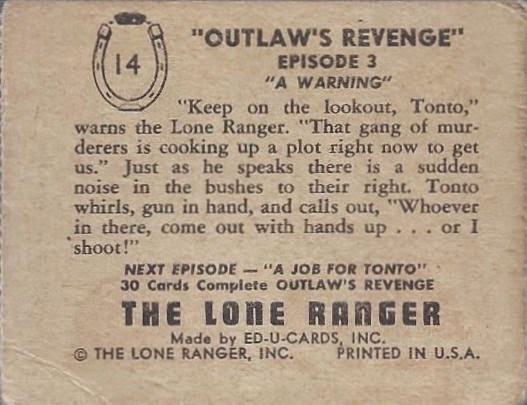 The Lone Ranger was not a typical Ed-U-Cards product and they would not issue anything else that was close in style. Whatever the reason, they deviated this one time and never did it again. 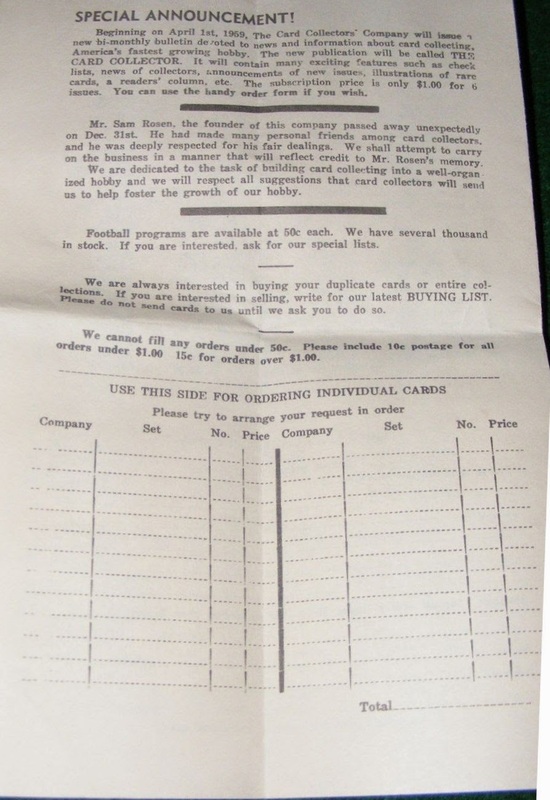 I keep missing out on some eBay auctions of old Card Collectors' Company price lists. 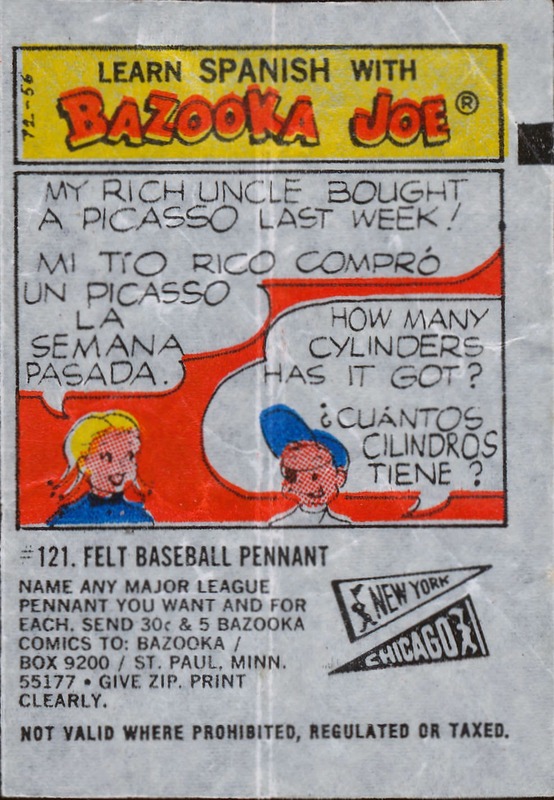 It's not a huge deal as there are usually enough scans provided for the auctions that I can get at the information I want, namely the extant supply of scarcer Topps cards as each successive price list was issued. There's also some ancillary information in some of these lists and one that definitely fits that bill is No. 10, dated March 20, 1959. I had his death date as 1955 in my book but clearly that was wrong. You can click over to the book's update blog here or by clicking the link at the top right of this page. Rosen had a lot of inventory at the time of his death. 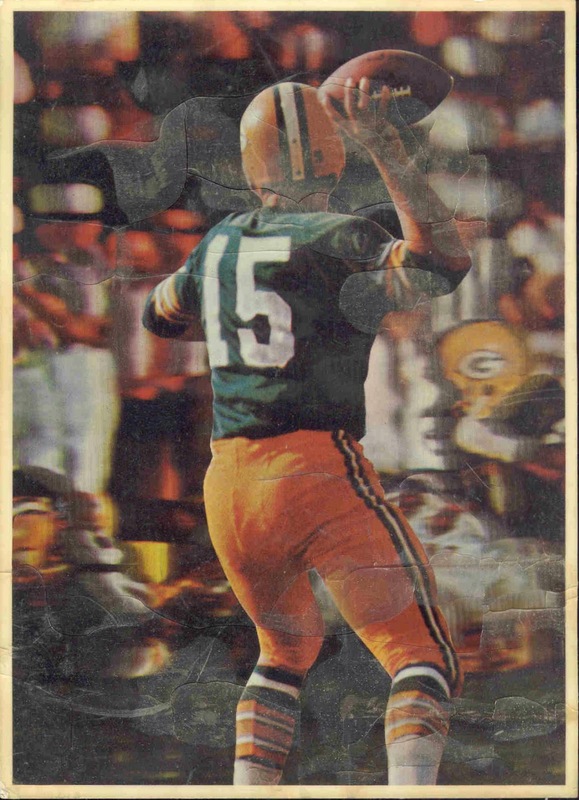 You can link here to an ad of his from a 1957 issue of The Sporting News and see that he advertised over 1 million cards in stock. 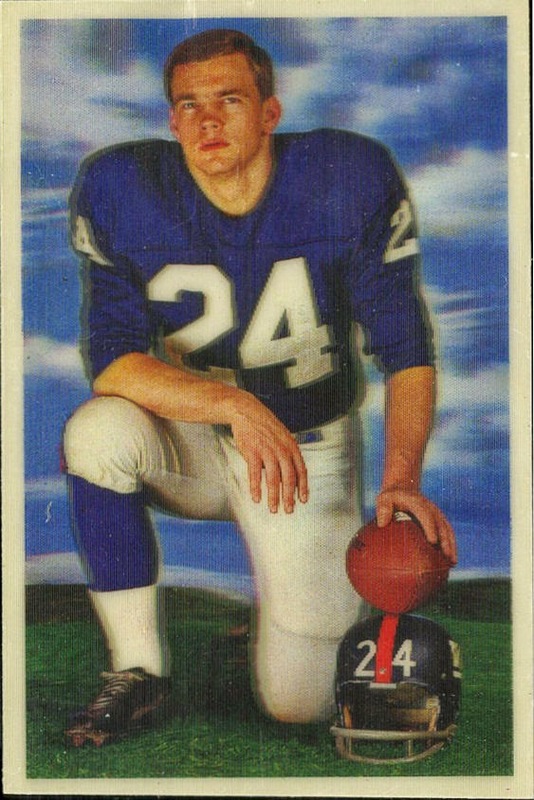 That is clearly some Jack Davis artwork that Woody scored. If you clicked the link to the Sam Rosen ad above, you will see that mailing address changed from 110 West 34th St (Manhattan) to the town just down the road from Woody's hometown of Malverne, NY. The Manhattan address was almost certainly just a mail drop as I can't see a midtown rent working out when cards were selling for two cents apiece. That locale is just across the street from Macy's and next to the (at the time) Gimbel's department stores and was (and still is) as heavily trafficked an area as there is in New York City, being just off Herald Square. Too bad I missed out on winning this price list but I am happy enough to mine its riches even in defeat. 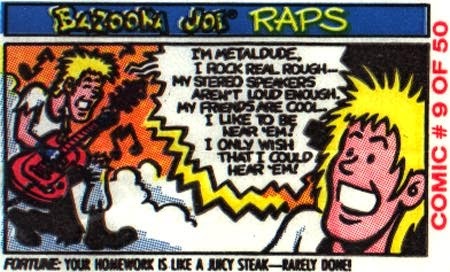 I have been digging deep into the Bazooka back story of late and finding all sorts of interesting things. 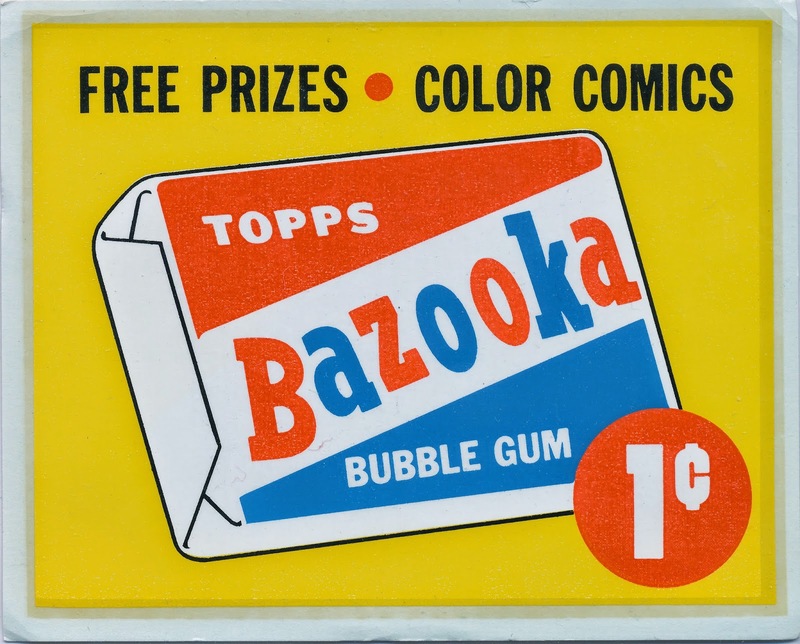 As many regular readers here know, there was a wealth of premiums offered over the years by Topps and Bazooka comics were the source of many of these trinkets and gadgets. 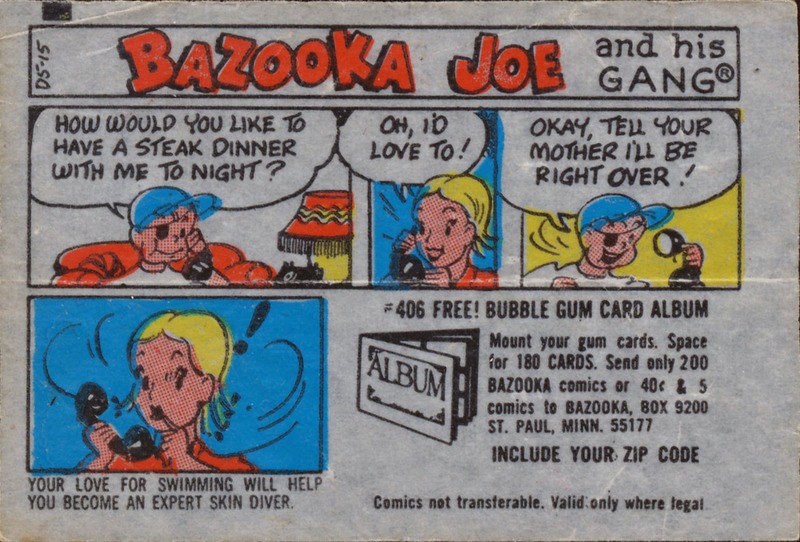 I thought a look at some of the more offbeat Bazooka Joe comics and premium offers would be a fun diversion today. 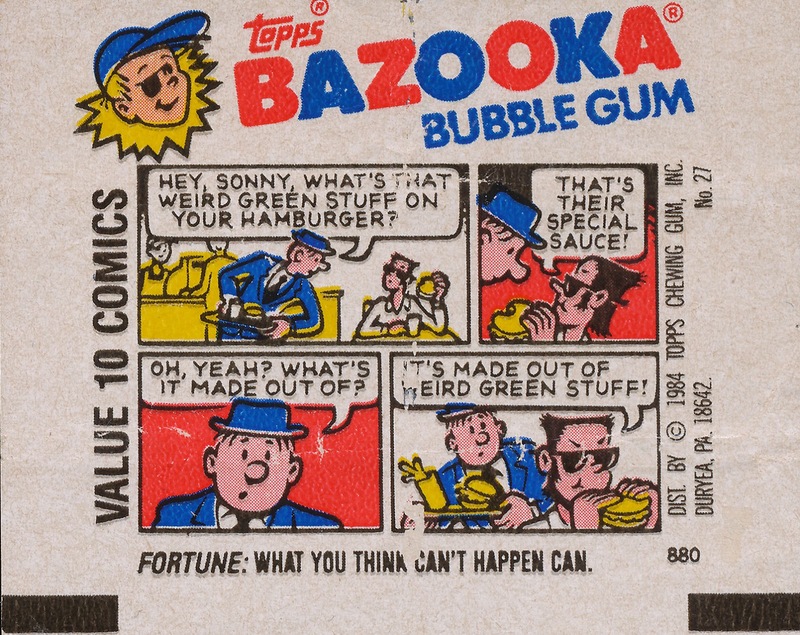 First up is a 1957 Bazooka Joe one cent comic exhibiting signs of the high speed cutting process used by Topps at the time. 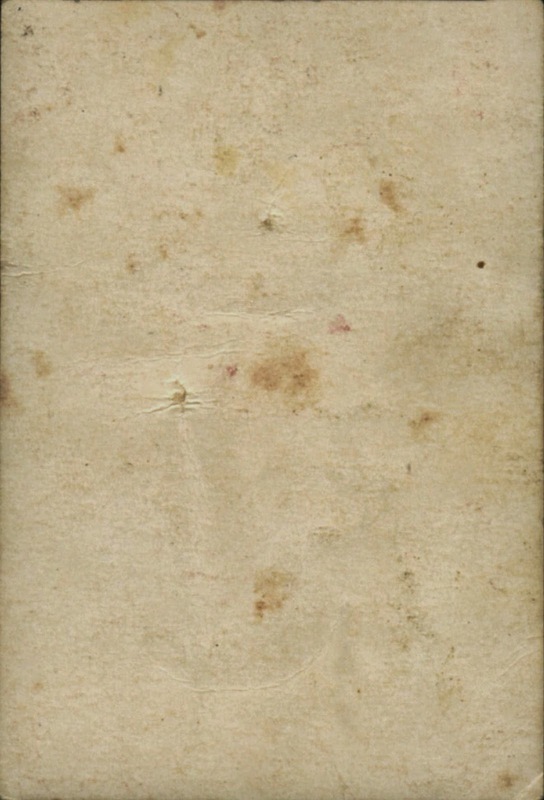 I believe the comics were folded (the diamond marks the spot) and then cut, which explains the Rorschach like pattern. 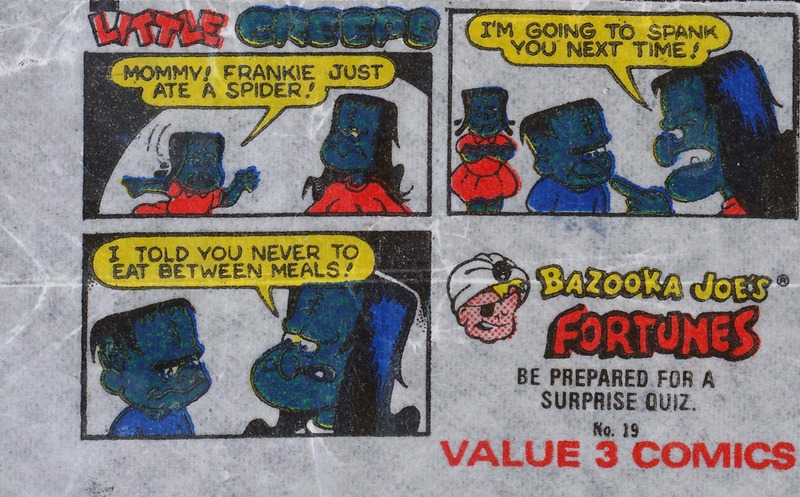 I especially like the black-and-white first panel and the entire comic seems a bit noir-ish. Geez, that Jerry Mahoney keychain charm is frightening! Another 1957 comic with something for the ladies. You don't often see premiums (or much else) from Topps, so this bride doll is a head turner. It's alsoan expensive premium by the standards of the times. 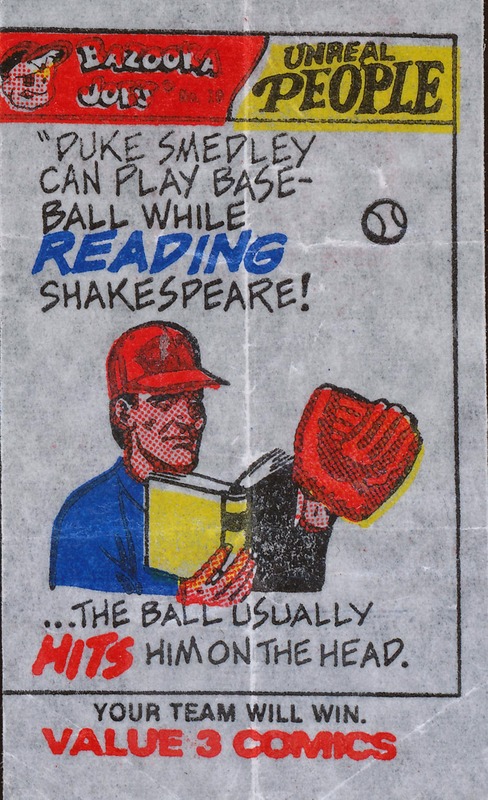 This 1965-ish comic possibly features the Topps Gum Card Album discussed here many yonks ago. I don't know why the one above only holds 180 cards when the most common one can house 208. There were also some albums produced in 1965 and 1966 by third parties designed to hold Topps baseball cards but I have no idea what this premium looks like as the graphics are less than helpful! 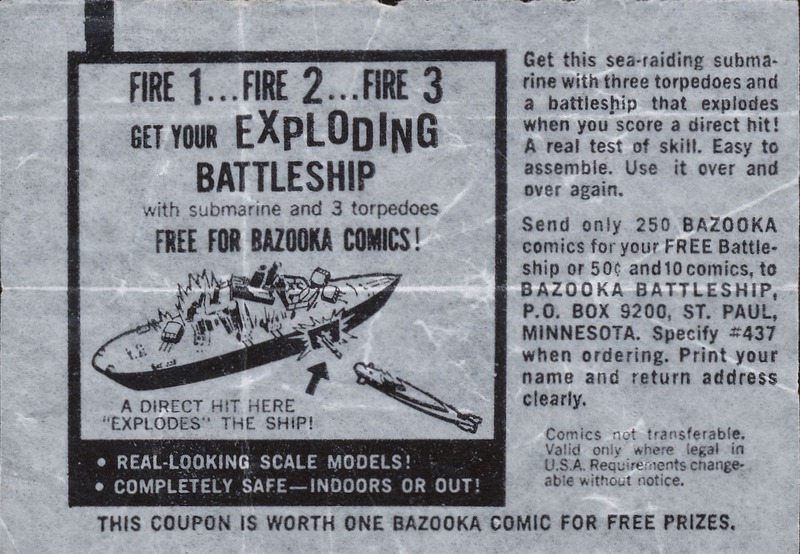 This "roll" comic (it came with the five cent roll of Bazooka that looked a little like a cigar with score marks) does not have a code that speaks the date to me but the premium represents overstock of the only two issues of Topps Fan Magazines from 1965. A $1.00 value on distributor returns? Hah! 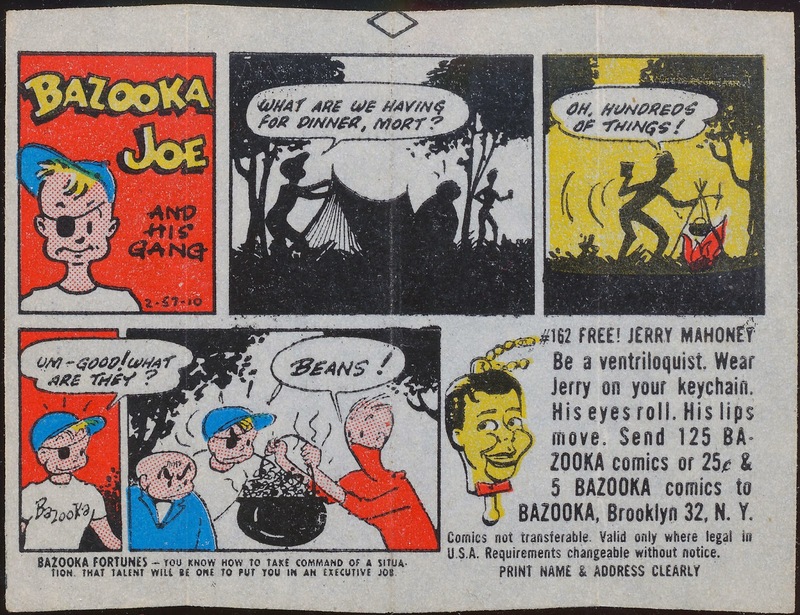 Those felt baseball pennants go back to the origins of Bazooka, although these are probably the latest in the redesigned series that commenced in 1958-59. Still #121 was an ancient premium number by 1972 as the most common ones seen were from the "400 series".